« The Ave Boutique Residences in North Vancouver’s Marine Drive District Now Selling! ONE and TWO bedroom homes in Vancouver’s Cedar Cottage neighbourhood are coming soon to Mercer by Cressey! Starting from the mid $300’s, the new Vancouver Mercer Condos by Cressey Developments are located at 3470 Commercial Street Vancouver. Belong to something different! 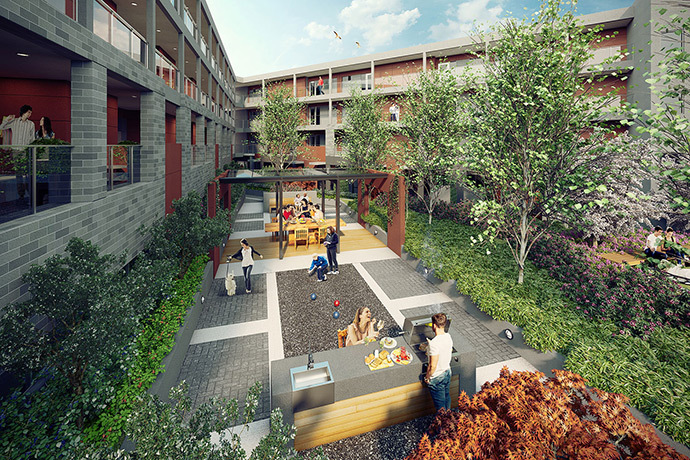 Only 48 boutique apartments overlooking a lush Secret Garden, the new Mercer by Cressey Vancouver condos is a truly rare o9pporutnity to own your view own apartment in the most celebrated Cedar Cottage Vancouver neighbourhood. Superior design and great quality construction are evident in all the details and of course, every home features the highly sought after CresseyKitchenTM. Sales start in late Fall 2014. One bedroom Mercer Vancouver condos start from the mid $300’s whilst the 2 bedrooms start from the mid $400’s. Mercer by Cressey is located where Commercial Drive meets Victoria Drive Vancouver and the decorated show home and presentation centre will be opening soon. Best of all, the homes at Mercer Vancouver condos will be move-in ready by Spring 2015 (anticipated completion) and you can find more information online at www.cressey.com or www.mercerbycressey.com today. The close proximity to The Drive, bike routes and local transit make this centrally located development a must-see for any urbanite. As well, the Mercer Vancouver condos will be very close to the best off-lease dog parks, local amenities such as restaurants and eclectic boutiques in addition to Trout Lake Park. The Cedar Cottage neighbourhood is historic, well established and gradually changing. Located just south of Commercial Drive, the neighbourhood is both promising and exciting and can be your new home! Construction is already underway and the intriguing flatiron style architecture and triangular shape make this project truly unique to the city. The refreshing yet historic architecture will blend seamlessly into the Cedar Cottage community. There will also be ground level boutique retail stores and a beautiful indoor courtyard space that will become the community’s most unique amenity space. The Mercer Vancouver condo building is open in the middle with outdoor hallways that overlook the Secret Garden at Mercer by Cressey, so that every home will have both front and back windows, providing plenty of natural light into your home. As well, there is great airflow because of this architectural feature. Lastly, you can purchase a brand new condo with only five per cent down during a limited time offer. The classic Cressey high-end interior finishes will also make their way to the exciting Vancouver Mercer condo project. From engineered hardwood floors to wood grained laminate cabinets and tiled bathrooms with NuHeat in floor heating, the best of the best features will be incorporated and designed just for you. The Vancouver Mercer by Cressey condos will also come with the famous CresseyKitchenTM that includes fabulous quartz stone counters, a 365 inch fridge with French Doors and high-end KitchenAid appliances including a gas cooktop and a Chef’s Wall with fully integrated wall oven and microwave. This is truly a dream chef inspired kitchen designed just for you at the new Cressey Mercer Vancouver condos. More details about other interior finishes will become available during the grand opening launch. 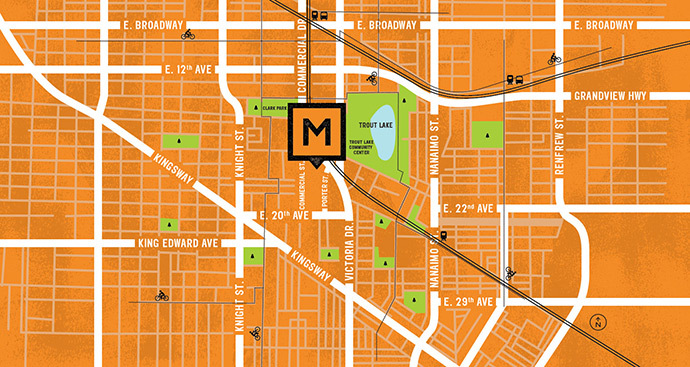 In addition, the Vancouver Mercer floor plans will be featured during the VIP presales coming soon! COMING SOON! Belong to something different here at the Eastside Vancouver Mercer Condos by Cressey! Only 48 boutique apartments overlooking a lush, Secret Garden will be coming soon to the new Cedar Cottage Vancouver neighbourhood. 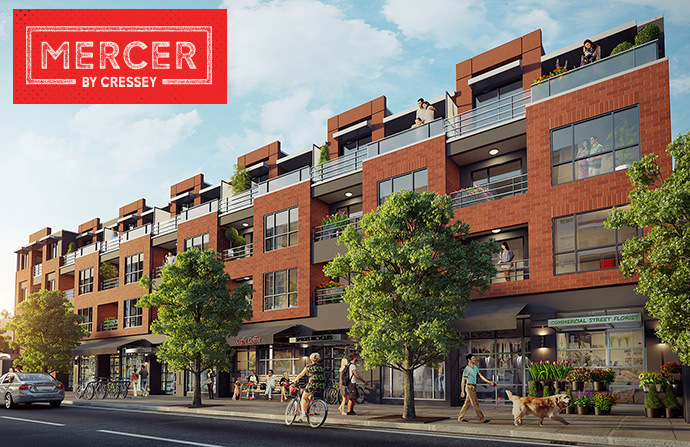 Mercer by Cressey is truly a rare opportunity to own your very own Cressey home in Vancouver’s Eastside neighbourhood. Superior design and quality construction are evident in every detail, and of course, every home at the new Cressey Mercer Vancouver condos will feature the famous CresseyKitchen TM. Sometimes you just want to get away from it all. That’s what the Secret Garden is for here at Mercer Vancouver condos. Sales will start in mid Fall 2014. The one bedroom Mercer Vancouver condos will start from the mid $300’s while the 2 bedrooms will begin from the mid $400’s.